I hear so many people complain about the hassle of air travel but no matter how often I fly, I’m still amazed by the fact that in mere hours, we can travel from one side of our glorious planet to the other. It doesn’t matter how many times I do it, air travel will always remain a modern miracle to me. I mean honestly … the fact that airplanes, so huge and heavy, can transport hundreds of passengers, their luggage and additional cargo, through the skies is really pretty mind-blowing. For me, flying is as much a part of the adventure as my final destination. 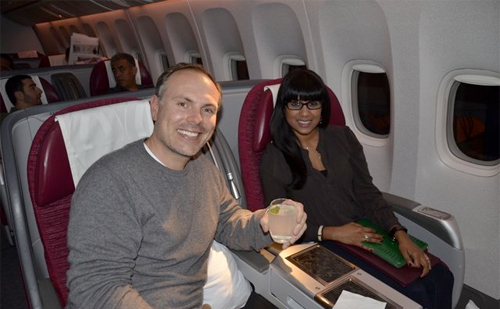 I recently had the privilege of flying Qatar Airways from New York’s JFK to Doha, Qatar and then on to Mumbai. I was excited to check out Qatar Airways. I’d never flown with them before and I’d heard all about their great product and service. Business class passengers have their own personal entertainment systems (with over 1,000 entertainment options including movies, music and video games) and I was looking forward to settling in to watch a few flicks but unfortunately, my unit wasn’t working. Definitely a bummer but since we departed so late, I was just as happy to recline my lie-flat seat and get some shut eye. The flight was a breeze (I know – of course it was in business class!) 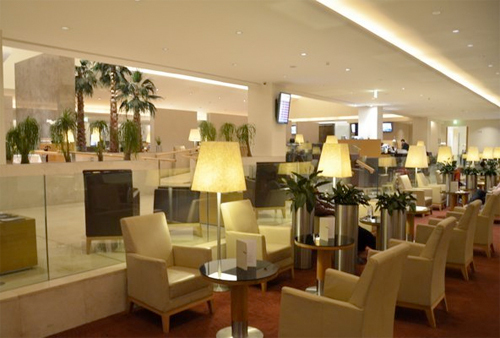 and I felt relaxed and refreshed by the time we landed at Doha International Airport. The airport is currently undergoing construction so passengers are shuttled from the plane to their gate. But once we got into the airport, I was struck by how large, bright and welcoming it was. The premium class lounge is huge, with a large buffet filled with local and international foods and free WiFi – very important for an Internet junkie like me. How else would I update my Facebook status to let friends and family know I’d landed in Doha? Overall, I give Qatar Airways top marks for a clean and comfortable plane, impeccable on-board service and all the special touches (pajamas, Godiva chocolates, a menu with gourmet food options) that make flying business class worth the price of a ticket. Have you flown Qatar Airways before? What was your experience like? 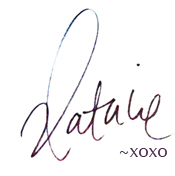 Natalie, it was our pleasure to have the two of you onboard Qatar Airways Business Class. We are keen to continue sharpening our focus on every detail surrounding the Business Class experience on our ultra-long-haul routes. Your write-up has helped validate that this focus is improving, so thank you for that. However, we are never done. Just wait for the new #Qatar787 Business Class product to enter our fleet. That will take things to another level. Hi Michael – thanks for your comment! I really loved my experience on-board Qatar Airways and look forward to seeing how things evolve!